Tensions are running high tonight in Ballinderry after a leaked document from the ‘maps department’ at Stormont indicates that Ballinderry will now be considered wholly in Tyrone, starting from August 1st, after a re-alignment of the Ballinderry River. The PSNI have issued a warning to anyone resisting the swtichover that they will be dealt with severely. On August 2nd, houses north of the river will be searched and any pictures of Dana, Seamus Heaney, Henry Downey, Enda Muldoon or Conleith Gilligan will be destroyed. Small statues of Frank McGuigan and Chris Lawn have been sent to all households in the present Derry region of the parish to help them acclimatise to the new changes. 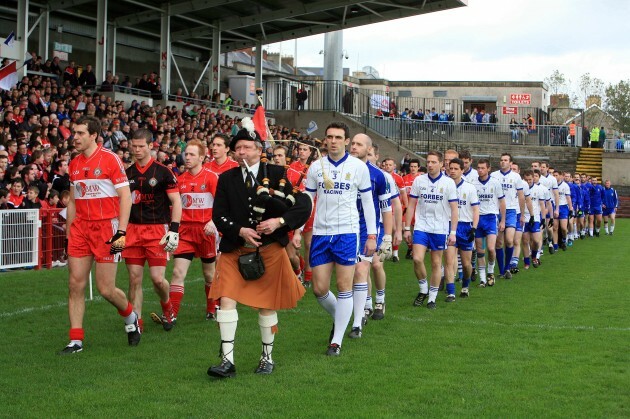 The whole of Lissan might be given to Derry as a thank you. Posted on July 28, 2013, in Ardboe, Ballinderry, Lissan, Moortown and tagged Ballinderry, ballinderry river, chris lawn, conleith gilligan, dana, Derry, Donaghmore, enda muldoon, frank mcguigan, Greenvale, henry downey, mcguckin, seamus heaney, TYRONE. Bookmark the permalink. 7 Comments. Word is he’s a loose cannon and can’t be talked down. We Canadians are quite concerned about the events unfolding in Ballinderry. “McGuickin” should just calm down. Although after saying that we recognize his right to free speech. “McGuckin” ‘s words are hot but at least “McGuchin” is not grabbing someone by the neck then yanking them around, by the collar, as our elderly Canadian ambassador to Ireland did in a shameful fit to a much younger Irish protester in Ireland,. Hopefully our angry Canadian ambassador will be prevented from,intruding into the affairs of Ballinderry, thereby not be allowed to inflame the situation even more. Calm heads should prevail. We’re not interested in a whole culture vulture scenario. We don’t want your ice hockey or tendency to in-breed. We want what is rightfully ours from the days of Shane the Proud and the blind fiddler. This site is a bit tricky much obliged if you could remove my first post at the top to leave my second one in place.